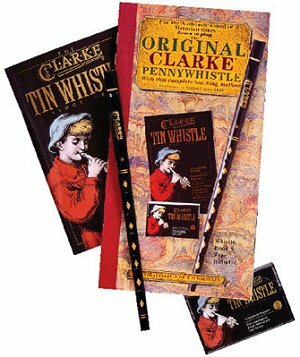 No other whistle can match the original Clarke Penny Whistle's clear, flute-like tone quality. The Clarke Penny Whistle also has a long and fascinating history. In 1843, Robert Clarke a poor farm labourer left his employer after having been unjustly accused of dishonesty. He was a talented amateur musician and played a wooden whistle. He developed the idea of copying his whistle but used tinplate to do so. He made the block in the mouthpiece out of wood which he cut into shape using a homemade saw. He decided to mass produce his new style of whistle. Loading his tools and materials onto a handbarrow, he set off with his son on a very long walk from Suffolk to Manchester. On the way, he regularly set up his workshop handbarrow in market places, showing how the whistles were made and selling them. He would also play for the entertainment of the crowds that gathered round. His most popular piece was "Danny Boy". It is said that the whole busy market would stop and listen when he played this piece. In Manchester, Robert Clarke started manufacturing his whistles and, as the years went by, his whistles became world famous under their definitive name - PENNY WHISTLE. 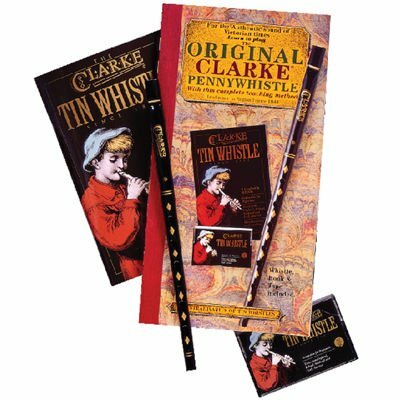 The Clarke Pennywhistle Company has been producing penny whistles from the mid-nineteenth century to this very day. Some famous musicians made their start in music with these instruments. In fact, James Galway, the world-renowned flautist, first learnt to play on a Clarke Pennywhistle. Learn to play the pennywhistle featuring the original Clarke Pennywhistle. Your own Clarke Pennywhistle has the tradition of over a century and a half embodied in it. Pennywhistles can be found almost anywhere, but this is the real thing - the original Clarke Pennywhistle, made in England. Black enameled tin with a wooden fipple (you'll find out what a fipple is) in the key of D, made the same way for 150 years! Our set includes the original Clarke Penny Whistle with an 80 page handbook and 90 minute teaching audio CD, delivered in an attractive gift box.